for the electronic scoresheet which officially replaces the paper version: limiting the intervention of the operator, it tries to eliminate any error by checking all situations and unforeseen circumstances during a match. with all Data Project products. It’s connected with Volley Board and LiteScore for the official score, with Data Video Essential for the videos synchronization, with Data Volley for the line-up. thanks to Web Competition Manager: the match information & rosters are filled in the scoresheet, the score is transmitted in real-time to the Live Score. and to facilitate the scorer’s job, two different apps: one for referees, to quickly consult information, one for the bench, to send requests such as timeouts and substitutions. E-Scoresheet is the software that guides you to compile the match scoresheet in real time, through automatisms, in order to limit to the maximum the intervention of the operator, by checking all situations and unforeseen circumstances that may occur during a match and by suggesting an eventual solution. 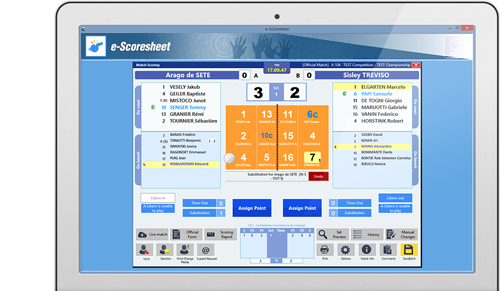 E-Scoresheet connects to the organization website in order to automatically update the score, and the database. Also updates the LiveScore. It is fully integrated with all others Data Project products, creating a complete and interactive system.